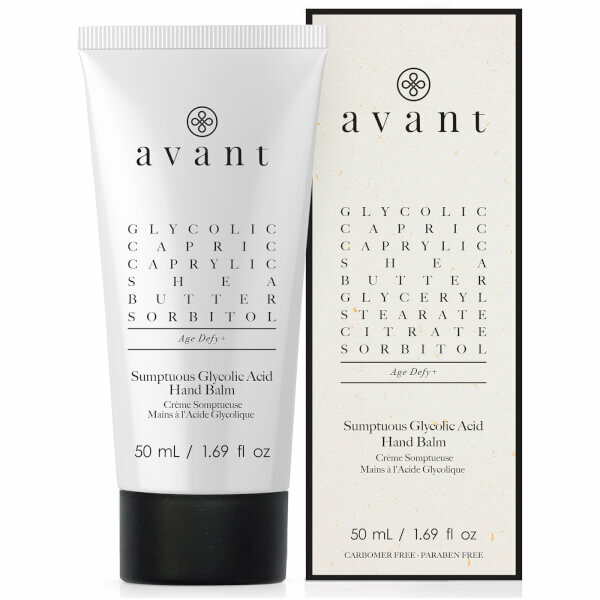 Revitalise ageing hands with Avant Skincare Sumptuous Glycolic Acid Hand Balm. The formula penetrates deep into the skin’s layer to restructure the surface for youthful-looking skin. Glycolic Acid firms and smooths the complexion, reducing the appearance of fine lines and wrinkles and treating oiliness. Shea Butter brightens dull skin and leaves it touchably soft and supple. Start by removing all jewellery and wash your hands with a gentle hand soap and lukewarm water. Apply a pea-sized amount of your rich hand cream onto the back of your left hand, and delicately rub in circular movements, paying special attention to your knuckles and any especially dry areas. Repeat on your right hand. Gently massage the cream right from the tips of your fingers to your wrists, and right around your cuticles for maximum care and protection. Aqua (Water), Ethylhexyl Stearate, Caprylic/Capric Triglyceride, Cetyl Alcohol, Sorbitol, Cetearyl Alcohol, Glyceryl Stearate Citrate, Butyrospermum Parkii (Shea) Butter, Glycolic Acid, Cetearyl Glucoside, Stearyl Alcohol, Cera Alba (Beeswax), Bht, Xanthan Gum, Citric Acid, Parfum (Fragrance), Benzyl Alcohol, Phenoxyethanol.